I began traveling at 3 years old, lucky to have parents with a connection to the world and the desire to satisfy the need to experience that connection. At age 11, while taking a cold bucket bath in Indonesia, I was terrified as I lifted my towel and found a coiled snake sleepily looking up at me. I leapt over it, rushed across the hall to my room, flicked on the light and was literally shocked as my wet hand met with the electrical current. From then on, I was hooked on travel. I chose the degree of World, Arts & Cultures at UCLA as a continuation of my interest in the cultures of the world and as a catalyst to travel extensively and live in different countries. Money ran out often throughout my wanderings and my list is left unfulfilled. While studying for my Masters Degree at NYU, I fell into a depression and struggled with knowing my place in the world. My oasis of peace amid the craziness of NYC was the Integral Yoga Institute, an ashram in the middle of the city. Needing a break from the intensity after graduating, I left NYC for the quiet of the California coast. I hiked the redwood forests and learned to surf. I delved deeper into the practice of yoga and was drawn back to Integral Yoga to do my first yoga teacher training. Inspired and feeling like a new person — lighter and more at peace — I began teaching immediately. I did a further training in Therapeutic Yoga to deepen my understanding of the healing powers of yoga. My classes infuse the Hatha asana practice with restorative poses as well as pranayama and meditation. My next training while at the Integral Institute in India was co-taught by a Vinyasa instructor expanding my teaching knowledge. I began incorporating Vinyasa flow into my classes, finding a balance between active movement and stillness. While planning on only spending two months in India, I couldn’t leave, ultimately staying for a year. I found places to study dance, to learn Hindi, and experience yoga in India. I was initiated into a meditation practice that took me to a revelatory place. 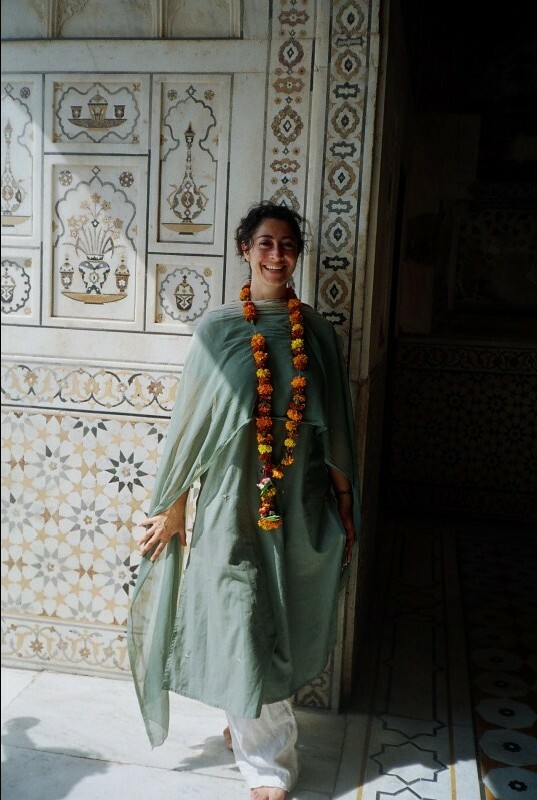 I studied chanting along the Ganges. I meditated in a cave. Yoga inspires, fulfills, and teaches me, constantly. It is an evolving and life long practice. I have surfed the waves of understanding and fallen off the board many more times than I have stood up. But I keep trying. I love to travel, to teach yoga, and to write. I took a hiatus for a few years to have my son which has been the most challenging and rewarding and overwhelming and instructive thing I have ever experienced. He is my light.